This is the deck I would have used had I been able to participate in the Shadow Era World Championships of 2014. Ultimately this deck is tuned to my play style and how I wanted to approach the Qualifier events. I started with my Gravebone: Undead Necromancer build and transitioned in some other cards that could help me in various matchups. 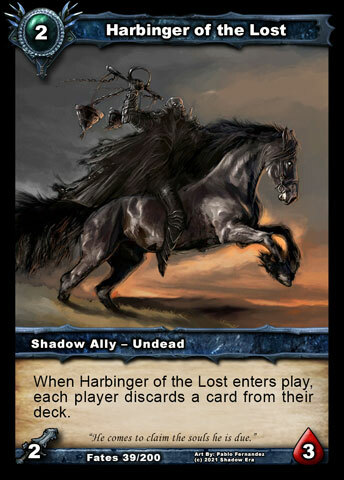 Two of the typical core cards for my Gravebone builds are Harbinger of the Lost and Falseblood Cultist. Both of these cards alone help to speed up Gravebone’s game play by putting allies on the board, while also assisting with getting allies into the graveyard which simply bypasses the board altogether helping to have key allies available for a revive with the hero ability. Harbinger has a lower cost of the two but his discard is random, while Falseblood gets to specifically choose which card in your hand is discarded. Harbingers base stats are rather underwhelming at 1/3, but if either card discarded via his summon is an ally he can gain 1 attack and 1 health making him a 2/4 which makes him one of the top 2cc allies for early game. Falseblood is not able to increase his stats from discarding (in this build) but he will instead draw you two cards, which can be a good play while your advancing the board and think opponent may be planning a wipe on the following turn. This is the general meat of the deck which is built to utilize supernova and gain some advantages over my opponents. 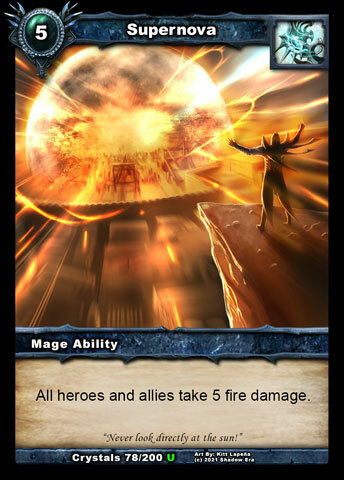 Supernova combined with Gravebone’s ability creates a nice tempo swing in your favor especially if opponent has no surviving allies. Both Dakrath and Phoenix Urigon have great synergy with Supernova, in that they can survive in one way or another. Dakrath is a pretty strong ally and can create problems for opponents who do not have an immediate answer to him. Phoenix Urigon is not necessarily a threatening ally but he creates an opportunity for you to penalize your opponent who may be using board wipes. 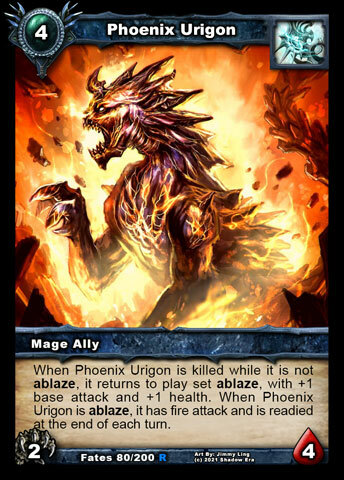 Phoenix Urigon also combos very well with Sacrificial Lamb. The following group is the “haste” support category. Death Mage Thaddeus and Rampant Krygon are both bodies on the board plus summon damage and Fireballs are just the best cost to damage ratio. Death Mage Thaddeus is typically the better turn 3 play as you get everything he has to offer simply from summoning him. Other than his summon ping he basically is your star against stealth builds. Rampant Krygon is an option for a turn 3 but you typically want to play him later when you can also use his ability. Using Rampant Krygon’s ability on Dakrath is excellent because Dakrath already has a built in damage blocker and will remain hard to kill. Rampant Krygon’s ability can be also used on Phoenix Urigon who becomes more threatening ally and harder for your opponents to ignore, plus if he dies he can come back. Rampant Krygon is also an excellent play following a board wipe to help recover some tempo you may have lost. The draw for the deck is fairly similar to my other builds. 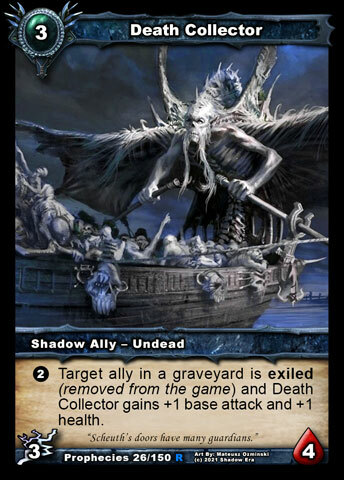 I love using ally cantrip draws with Gravebone because they give me two things I feel like I constantly need allies and draw. Typically the draw allies have low health to balance out the built in draw feature. 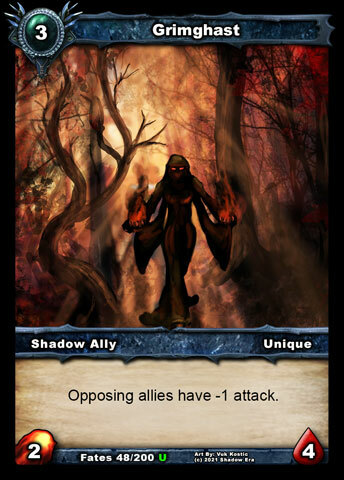 Shadow Knight is one of the most aggressive and unique of these type of “draw” allies available. 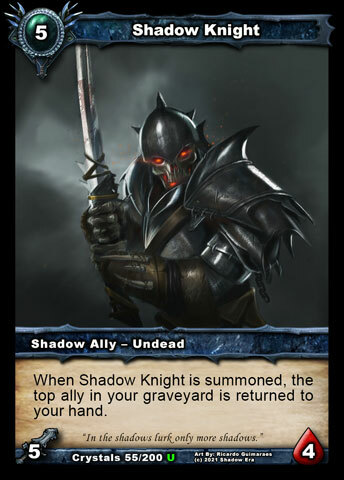 Shadow Knight provides a “known” pseudo draw in that he will retrieve the top most ally of your graveyard and is able to loop himself. Bloodpack Shaman is also able to do this but is limited to Wulven class only. 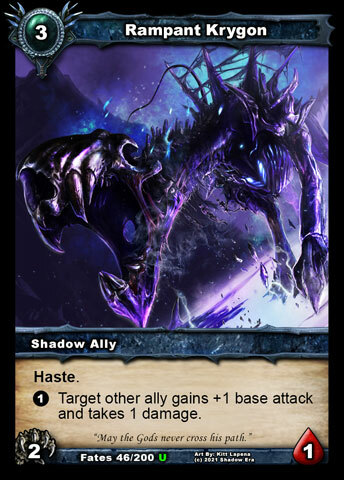 Shadow Knight can get shut down by exile options which remove allies from your graveyard reducing available allies to retrieve as well as Spirit Warden who’s ability prevents allies for being retrieved to hand from the graveyard. You can read more about Spirit Warden here. Falseblood Cultist is by far my favorite ally cantrip for Gravebone. The discard feature actually helps Gravebone vs hurting him by putting a specific ally in the graveyard which Gravebone can then revive with his hero ability. This creates an opportunity for Gravebone’s ability to be used earlier in the game and is one of the reasons his game speed has picked up more in line with other heroes. 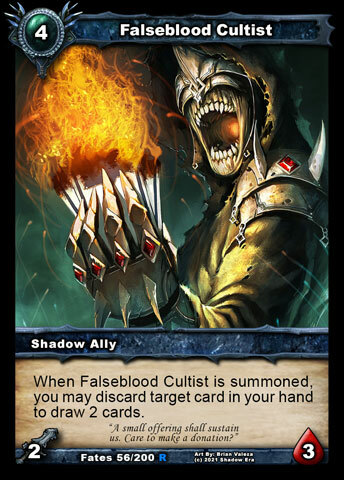 In addition to the discard and body, Falseblood Cultist also draws you 2 cards allowing you to maintain some draw tempo. Sacrificial Lamb is always a good option for Gravebone to include. 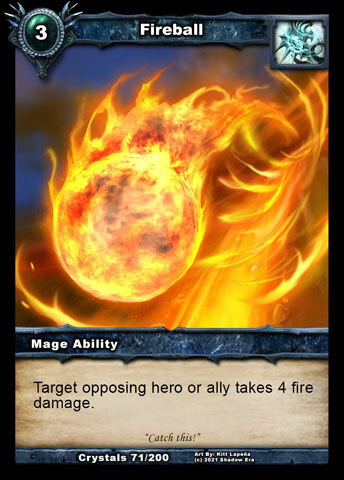 He can kill the ally for drawing cards and then make a secondary use of these allies by reviving them with his hero ability. Normally I do not particularly like Tome of Knowledge with Gravebone, but because of the resource curve of the deck there are lots of opportunities where you have a few resources left over which means the resource cost can be utilize effectively. Tome of Knowledge does not generally become effective until you have around 6+ resources. There are a few tech cards in this deck. 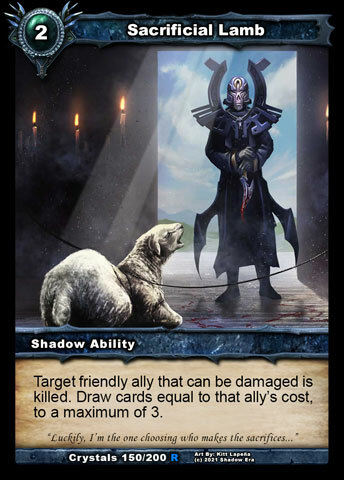 The allies help to fill the 3cc ally slot which is very important to Gravebone, but these allies also have a utility to them. Death Collector is a great ally on his own, have the potential to become a “fatty” simply by using his ability to grow. 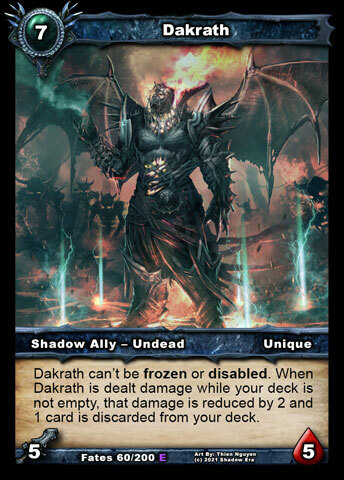 Death Collector’s utility comes from being able to exile opponents graveyard cards, which can help to shut down recursion decks attempting to utilize either Shadow Knight, Bloodpack Shaman, Infinity Core, Soul Reaper, and Ghostmaker. Grimhast is one of my favorite Shattered Fates allies. He is basically the counter to Aldon the Brave but better because his passive ability works on everyone’s turn. Grimhast’s ability turns him and other friendly allies into Gargoyle while in combat with opposing allies. Shriek of Vengeance is for a timely tempo swing, working more favorably once you get higher in resources. You can read more about Shriek of Vengeance here. Shriek of Revolution is the last of the tech cards which give a bit of flexibility against negative attachment but is also capable of removing buff attachments opposing heroes may be using such as A Legend Rises and Blood Frenzy. It also give a bit of overlapping flexibility with Shriek of Vengeance for support ability removal. The two Shriek cards are kept to a minimum to minimize dead draws against matchups they may be irrelevant in. Tagged Gravebone, Shadow era, shattered fates. Very nasty, I like it!! !